It’s BIG. It’s BLUE, and it was a BASH! 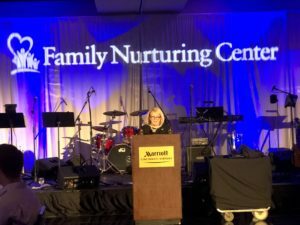 Many, many thanks to everyone who joined with Family Nurturing Center for the 24th annual Blue Ribbon Bash! A record number of guests, sponsors, auction items and donors made it possible for us to raise a record $83,000 for Family Nurturing Center and the child abuse treatment, prevention and education services that we provide to thousands of Greater Cincinnati children and families impacted by abuse and neglect. View and download photos from the Bash HERE!!! Congratulations to Lisa Knutson, executive vice president and chief financial officer for the E.W. Scripps Company who we recognized during the Bash for her long history of generosity, civic engagement and volunteer leadership at Family Nurturing Center and numerous other organizations, working to make Greater Cincinnati a great place for children and families to thrive. 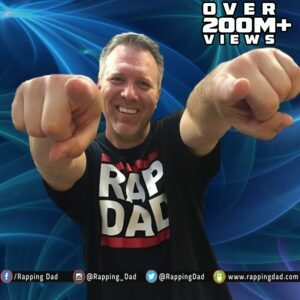 This year we were excited to have motivational speaker Derek Clark, otherwise known by millions of followers on his YouTube channel as, “The Rapping Dad”. Derek Clark knows first-hand the power of attitude in coping with adversity and overcoming hardship. At five years of age, Derek’s mother and stepfather (his biological father was in prison) abandoned him at a psychiatric hospital. He was turned over to the California foster care system, where he would spend the next 13 years of his life contending with rejection, humiliation, emotional distress and overwhelming anxiety. Yet through it all, Derek never gave up. Derek’s remarkable story is one of resilience and redemption, from his personal to professional life. Listen to Derek’s incredible story. Many thanks to our corporate sponsors for their belief in our mission to end the cycle of child abuse.